Consider the ending of the Declaration of Independence. What is honor? Why would it be sacred? Honor is not easily defined, but perhaps it is safe to say that to have honor we must be honorable. early 14c. (mid-13c. as a surname), from Old French honorable, from Latin honorabilis “that procures honor, estimable, honorable,” from honorare “to honor” (see honor (n.)). Related:Honorably. Honorable men and women live according to a code of conduct that embodies certain principles. Americans of the 18th Century lived according to the principles taught in the Bible. Did they have disagreements about how they should interpret the Bible? Yes, but they eventually agreed that Bible taught they should allow everyone the freedom to live by the dictates of his own conscience. Why do people become Christians? Every Christian has their own story. Did I become a Christian because I wanted to be a Christian? No. When I was younger, I was like that little boy named George. I wanted the larger slice of cake, but I am fascinated by history. So I studied history. In time I reached the conclusion that I could not make any sense of history without studying Christianity. So I started to read the Bible and study it. Then I learned how much God loves me, and I was ashamed I had not returned His love. 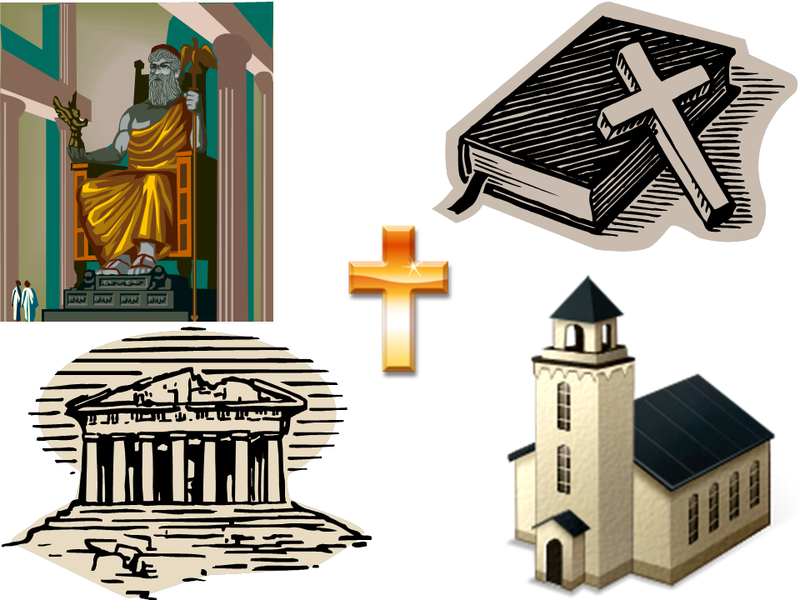 How did Christianity change the world? What made the life of Jesus the most important event in history? Writers far better than I have written about this. So I have excerpted a passage from such a writer’s book, Heretics by G. K. Chesterton. In what follows, Chesterton comments on the ideas of one of the heretics who served as the subject of his book. Here he explains the differences between what the ancient Pagans believed and what Christians believe. There is only one thing in the modern world that has been face to face with Paganism; there is only one thing in the modern world which in that sense knows anything about Paganism: and that is Christianity. That fact is really the weak point in the whole of that hedonistic neo-Paganism of which I have spoken. All that genuinely remains of the ancient hymns or the ancient dances of Europe, all that has honestly come to us from the festivals of Phoebus or Pan, is to be found in the festivals of the Christian Church. If anyone wants to hold the end of a chain which really goes back to the heathen mysteries, he had better take hold of a festoon of flowers at Easter or a string of sausages at Christmas. Everything else in the modern world is of Christian origin, even everything that seems most anti-Christian. The French Revolution is of Christian origin. The newspaper is of Christian origin. The anarchists are of Christian origin. Physical science is of Christian origin. The attack on Christianity is of Christian origin. There is one thing, and one thing only, in existence at the present day which can in any sense accurately be said to be of pagan origin, and that is Christianity. The real difference between Paganism and Christianity is perfectly summed up in the difference between the pagan, or natural, virtues, and those three virtues of Christianity which the Church of Rome calls virtues of grace. The pagan, or rational, virtues are such things as justice and temperance, and Christianity has adopted them. The three mystical virtues which Christianity has not adopted, but invented, are faith, hope, and charity. Now much easy and foolish Christian rhetoric could easily be poured out upon those three words, but I desire to confine myself to the two facts which are evident about them. The first evident fact (in marked contrast to the delusion of the dancing pagan)—the first evident fact, I say, is that the pagan virtues, such as justice and temperance, are the sad virtues, and that the mystical virtues of faith, hope, and charity are the gay and exuberant virtues. And the second evident fact, which is even more evident, is the fact that the pagan virtues are the reasonable virtues, and that the Christian virtues of faith, hope, and charity are in their essence as unreasonable as they can be. Chapter XII Paganism and Mr. Lowes Dickinson of Heretics is too long for one blog post, but there is another virtue. Therefore, here is one more paragraph. When they read Chesterton’s words, some will counter by saying Jesus was a genius, merely a great philosopher. Christianity was just an evolutionary leap forward in Philosophy. But how could a poor carpenter and His twelve disciples (just ordinary men) have invented and spread this philosophy we now call Christianity? We also must wonder about Jesus’ miracles and the miracles His disciples performed in His name. Were these too just inventions by the men who wrote the Bible? The New Testament was written by Jesus’ contemporaries, men who had seen or spoke to those who knew Him. If Jesus was not the Son of God, these men had to know better, and all they could expect from their “inventions” was martyrdom. Therefore, we have a puzzle. We have men with nothing to gain who gave their lives to spread an odd philosophy, and we have accusers who say they either lied or they were deceived. When we think about that accusation of lies, why aren’t we filled with wonder? Why would anyone tell lies to promote the virtues of faith, hope, charity, and humility? This entry was posted in culture, history, religion and tagged Christianity, Christianity and Paganism, Declaration of Independence, G. K. Chesterton, Heretics, history, honor, Paganism. Bookmark the permalink. I appreciate the listing of all of the current day creations that are rooted in Christianty. Very interesting! I’ll need to read more of Chesterton. Thanks for sharing it with us!